FRAME: This has been specially designed and developed for racing incorporating the GREEVES patented cast aluminium beam resulting in a rigid light assembly. The main beam is die cast from LM6 aluminium alloy to British Standards specification. The steering head is fitted with Timken taper roller races. Electrically welded box section steel cradle plates carry the engine unit. SUSPENSION: Front: unique GREEVES design providing extreme rigidity and really positive steering. METALASTIK bonded rubber bushes are used and hydraulic damping is provided by GIRLING units concealed within the REYNOLDS '531' chrome molybdenum steel fork down tubes. These fork tubes have been lengthened to improve ground clearance. Rear: GIRLING multirate springs with hydraulic damping. Square section swinging arm. ENGINE: This is believed to be the most powerful standard production engine in the world for its size and weight. 246 c.c. 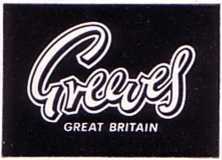 GREEVES/VILLIERS Mark 36A specially developed by us for racing. Bore and stroke 66mm x 72mm Compression ratio 12.7:1. Power output approx. 31 bhp at 7,400 rpm. Exclusive GREEVES light alloy cylinder and head fitted with a cast-in iron liner with precision machined ports for consistent high power output. Special racing piston with narrow chrome plated rings. Cutaway crankcase and latest pattern chain case for maximum cooling. 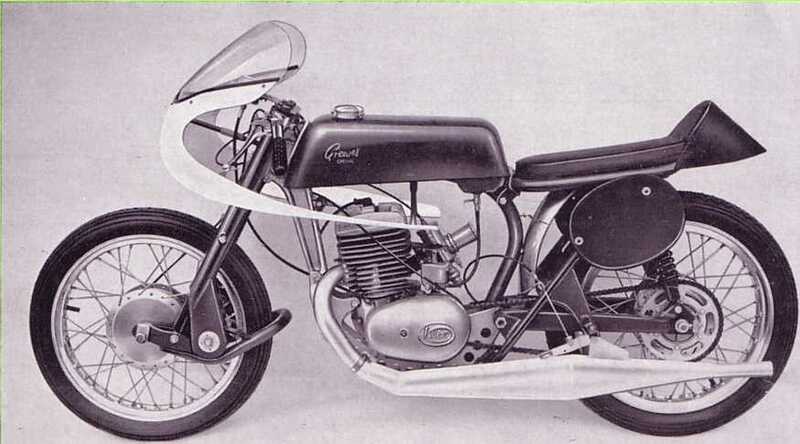 CARBURETTOR: 1|" AMAL Type 5GP2 racing pattern with remote float chamber. Spare jets supplied. IGNITION: Flywheel magneto with high voltage coil. EXHAUST SYSTEM: Specially developed with �tuned" expansion chamber giving an extremely wide power spread over the entire speed range. PETROL TANK: Readily detachable glass fibre reinforced plastic with quick release cap. 2 gallon capacity (Imp.). running in oil bath. Final drive: Renold's x chain. CONTROLS: Clamp-on handlebars providing adjustments both vertically and horizontally. Light alloy racing control levers with finger operated cable adjusters. HUBS: High-duty full width 6" diameter aluminium alloy hubs fitted with cast iron brake liner. Front hub fitted with floating brake back plate with nylon bushed torque arm. Air scoop to provide cooling. Rear hub fitted with knock out spindle. Vane type shock absorber to smooth out transmission loads. Brakes size, 6" x 1j". RIMS and TYRES: Racing pattern aluminium alloy. AVON 'Cling' racing tyre. Front: 2.75 x 18. Rear: 3.00 x 18. SEAT: Slim streamlined racing seat, made in glass fibre reinforced plastic trimmed high-duty PVC cloth. GEAR BOX: 4-speed, close ratio, high-duty gears. Overall ratios (with 50 tooth rear wheel sprocket as supplied) 1st: 15.2-1, 2nd: 10.6-1, 3rd: 7.56-1 and 4th: 5.96-1. FAIRING: Small streamlined racing pattern carefully designed not to impair engine cooling, etc. EQUIPMENT: Latest pattern Smith�s rev. counter, 0-10,000 r.p.m. fitted into an anti-vibration mounting. Glass fibre racing number plates. Two alternative rear wheel sprockets. Additional main jets. Comprehensive handbook with engine performance graphs. FINISH : Frame parts, etc., bonderised for rust protection, providing excellent key for high quality stove enamel. Steel parts, other than chrome, are cadmium plated. Aircraft type locknuts are used throughout. Seat height 28" Wheelbase 50" "Handlebar width 23" Weight 189 lbs. We reserve the right to alter designs, methods of construction, specifications, prices etc., without prior notice.